Maniraptora is the only dinosaur group known to include flying members, though how far back in this lineage flight extends is controversial. Powered and/or gliding flight is believed to have been present in some types of dromaeosaurid, such as Rahonavis and Microraptor. Zhenyuanlong suni, a dromaeosaurids, was too heavy to fly but still had wings with feathers required for flying, which suggests its ancestors had the ability for aerial locomotion. Other groups, like the Oviraptorosauria who had a tail with pygostyle like features, are not known to have been capable of flight, but some scientists have suggested that they could be descended from ancestors which flew. Gregory S. Paul has suggested that this might be the case. 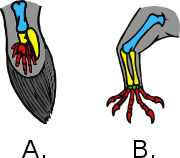 Paul has gone as far as to propose that Therizinosauria, Alvarezsauroidea, and the non-maniraptoran group Ornithomimosauria descended from flying ancestors as well. The branch-based definition usually includes the major groups Deinonychosauria, Oviraptorosauria, Therizinosauria, and Aves. Other taxa often found to be maniraptorans include the alvarezsaurs, Ornitholestes. Several taxa have been assigned to the Maniraptora more definitively, though their exact placement within the group remains uncertain. These forms include the scansoriopterygids, Pedopenna, and Yixianosaurus, and the dubious Bradycneme. 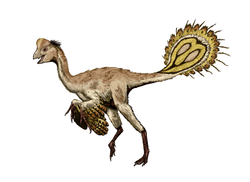 In 2002, Czerkas and Yuan reported that some maniraptoran traits, such as a long, backwards-pointed, pubis, short ischia, as well as a perforated acetabulum (a hip socket that is a hole) are apparently absent in Scansoriopteryx. The authors considered it to be more primitive than true theropods, and hypothesized that maniraptorans may have branched off from theropods at a very early point, or may even have descended from pre-theropod dinosaurs. Zhang et al., in describing the closely related or conspecific specimen Epidendrosaurus, did not report any of the primitive traits mentioned by Czerkas and Yuan, but did find that the shoulder blade of Epidendrosaurus appeared primitive. Despite this, they placed Epidendrosaurus firmly within Maniraptora. 1 2 Holtz, T.R. and Osmólska, H. (2004). "Saurischia." In Weishampel, Dodson and Osmólska (eds. ), The Dinosauria, second edition. Berkeley: University of California Press. ↑ Xu, X.; Tang, Z-L.; Wang, X-L. (1999). "A therizinosauroid dinosaur with integumentary structures from China". Nature. 399 (6734): 350–354. doi:10.1038/20670. 1 2 3 Turner, A.H.; Pol, D.; Clarke, J.A. ; Erickson, G.M. ; Norell, M. (2007). "A basal dromaeosaurid and size evolution preceding avian flight" (pdf). Science. 317 (5843): 1378–1381. doi:10.1126/science.1144066. PMID 17823350. ↑ Chiappe, L.M. (2007). Glorified Dinosaurs: The Origin and Early Evolution of Birds. Sydney: UNSW Press. 1 2 Zanno, L.E., Gillette, D.D., Albright, L.B., and Titus, A.L. (2009). "A new North American therizinosaurid and the role of herbivory in 'predatory' dinosaur evolution." Proceedings of the Royal Society B, Published online before print July 15, 2009, doi:10.1098/rspb.2009.1029. ↑ Longrich, Nicholas R.; Currie, Philip J. (2009). "Albertonykus borealis, a new alvarezsaur (Dinosauria: Theropoda) from the Early Maastrichtian of Alberta, Canada: Implications for the systematics and ecology of the Alvarezsauridae". Cretaceous Research. 30 (1): 239–252. doi:10.1016/j.cretres.2008.07.005. ↑ Chiappe, L.M. (1995). 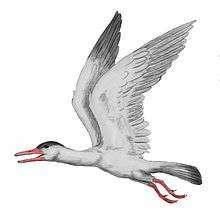 "The first 85 million years of avian evolution". Nature. 378: 349–355. doi:10.1038/378349a0. ↑ Cau, Andrea; Brougham, Tom; Naish, Darren (2015). "The phylogenetic affinities of the bizarre Late Cretaceous Romanian theropod Balaur bondoc(Dinosauria, Maniraptora): Dromaeosaurid or flightless bird?". PeerJ. 3: e1032. doi:10.7717/peerj.1032. PMC 4476167 . PMID 26157616. ↑ Zhang, F., Zhou, Z., Xu, X. & Wang, X. (2002). "A juvenile coelurosaurian theropod from China indicates arboreal habits." Naturwissenschaften, 89(9): 394-398. doi:10.1007 /s00114-002-0353-8.